Where is the wierdest place you’ve had a meeting? I like to have one-on-one meetings in more casual settings, and anyone who works with me has probably heard me say “let’s take a walk and get coffee” (meaning a walk to the local barista for a cappuchino). Dave and I often do walks around South Park for our meetings. In our Sunnyvale office, I’ve done a few meetings walking along the top of the old garbage dump (it’s now a nice hill with a running path). Thanks Caterina! Today though, I had the topper. Bradley and I met while sitting on the swings in South Park. I swear there was a four year old giving us dirty looks for using the playground for business purposes. Where’s the wierdest places you’ve had meetings? I’ve been wanting to get out and attend more conferences lately. I’m not usually a big fan of conferences, but I’ve been feeling like I want to meet more/new people and hear different perspectives on things. So, my coworker Mike and I attended Clickz’s Video Advertising conference today. This is clearly a field that isn’t figured out yet, so I thought it might be one of those “get to hear early insights” kinda days. Boy was I wrong. I had low expectations for the morning sessions (the interesting sessions were set for the afternoon) but even those expectations were missed. On both morning panels, there was only one clueful guy who actually seemed to be aware of what was going on on the web (there’s this thing called myspace, and another thing called YouTube people). I sat through excruciating demos of million-dollar budget “interactive websites” that looked like they were an artifact of 1999. And what was worse, these people were giving advice to people in the audience. “People want slick, professionally produced, immersive interactive experiences”. (never mind the lack of authenticity, the slow download time, etc). Someone later in the day even demoed a downloadable app that played a custom video. How smart. Anyway, I stuck it out in the hopes that the Yahoo speaker and the Google speaker would rescue the day. Usually google’s speakers run rings around everyone. Didn’t happen. Well, this panel couldn’t get less entertaining if it tried. You may have seen the notes from Daniel, Chad, Bradley or Jeremy, but our part of Yahoo is hiring (like crazy) and we’re looking for the best and brightest to come join our team. Engineers – you have great experience launching products, love working on bright team and have the technical chops to go with it. We code in all sorts of ways (depends on the project), but we do a lot in AJAX/HTML/PHP/MySql. Designers – you’ve designed and launched products from idea generation and prototyping to understanding users, designing wireframes and creating visual design comps. You should have a strong understanding of user-centered design principles, excellent visual design skills and an entrepreneurial approach to designing, building, and launching products. Product Managers – you’ve launched products big and small and now you are ready to roll your sleeves up and be part of an entrepreneurial team. You get excited about products and how to market them and can’t wait to launch your next big success. We need someone to guide the product from end to end – idea to launch to eventual handoff to our business units. And it’s not just my own team looking, its all of the Advanced Development Division (Bradley’s team) so you can work alongside the people that brought you Mixd, Yahoo! Pipes, Yahoo! Podcasts, Hack Day, Flickr, and many more kickass products. Today I stumbled across the announcement of the new Palm Treo 750. Back in October, I asked our mobile team here for a Windows Mobile phone to do some testing. Their response “oh, here’s one take it”. It was a Treo 750. While I love gadgets, I hadn’t read about the 750, so I didn’t even know it was an unreleased demo phone I was using. I thought it was just a new phone that I didn’t know about yet. Kinda cool that I got a three month advance on everyone. Thanks Yahoo! Well, anyway, I have to say I instantly fell in love with the Treo 750. I own a 650 and the 750 seemed to fix all the things that annoy me about my 650. It is lighter, it has a rubberized case, so I don’t have to get an extra “skin”, and it is slightly thinner. All of these things accompish my number one goal: make it fit in my pocket more easy. The phone I used had Windows Mobile on it, and while it was fast and reliable, I really do not like Windows Mobile. Microsoft continues to misunderstand the market completely. The start menu is a horrible way to change apps. Palm does it much better and I’ve seen others do it much better (Blackberry’s scroll wheel comes to mind). Using this phone made me realize that I will never use Windows Mobile. Last night the New Orleans Saints played their first home game since Hurricane Katrina in the newly remodeled Superdome. I think it is very important the world see that New Orleans is (slowly) coming alive. I went to New Orleans over the Labor Day weekend this year; friends and I had planned to go last year at this time, and when Katrina hit, we all made a pact to come to New Orleans this year. What I found was a city that was (like NYC after 9/11) a bit conflicted. New Orleans relies on tourist dollars for a large part of its economy and it was clear that they really need us to come back. About 90% of the businesses/restaurants in the French Quarter are now open. Damage in the quarter and the Marigny wasn’t very bad, and some of these businesses took the time to remodel or otherwise improve during low traffic times. On Canal St. the ratio was more 50/50 and as you reached the outskirts, we drove for miles without seeing any businesses open (we saw a McDonalds in a pile of rubble, a frame of a supermarket and a Pizza Hut with the roof blown off). Other friends actually drove to East N.O. and the now infamous 9th Ward and reported seeing miles and miles of devastation. But, truth be told, when you visit N.O. you would never have visited those areas anyway. I arrived on Thursday night and found the French Quarter to be relatively quiet. Bourbon St was pretty empty and I could imagine businesses are suffering. I found many stores had little signs “open only Fri, Sat, Sun”. As the weekend progressed, the quarter came to life, but it was still less than when I’ve been there in the past. For example, finding restaurant reservations was really easy. I met a guy who’s been living in a FEMA trailer with his parents, and his brother and sister-in-law, 5 people in a teeny metal box. He described it: “it’s like one of those trailers you go take for a weekend camping trip, except that we’ve been living in it for a year”. The surprise was that he was resigned to it without being sad about it “it is what it is”. The good news for him and his family, they were in the process of painting and furnishing their home. Probably as I write this they are moving into their rebuilt home. My favorite story was talking to someone about Halloween last year. 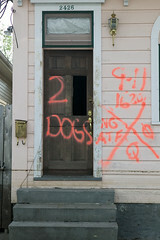 All around New Orleans, all the buildings have spray painted X’s on them marking the date the building was searches, survivors found, and any animals inside. (BTW, we spent a lot of time drinking in a place that had 3 cats after the storm). So, this guy and his friends all dressed as houses. They got T-shirts, dipped them in brown dye (to about 1/3 of the way) to look like a water line and then painted the fema markings on them. A fun costume that made light of what had to have been a very difficult time. 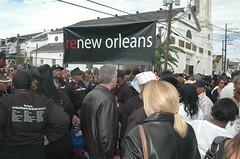 It was this spirit I found in a lot of people, and it makes me believe New Orleans will come back. So, I’ll tell you what I’m telling everyone. The areas that tourists visit are back in gear or on their way back, but they need YOU. Without the dollars to support the businesses, they’ll go out of business. Book a trip to New Orleans. Contribute your dollars to their economy. Go and have fun, listen to Jazz, have jambalaya and listen to people’s stories. It is still a fun place, the people are still strong and high sprited. But as we said about NYC after 9/11 – it’s time to come back. I’m off to NYC for the Syndicate Conference. At December’s conference I gave a keynote, this time I’m happy to just be able to enjoy the conference as a participant. My colleagues Peggy White (GM of Y! Finance) and Chad Dickerson will be doing the speaking this time around. If you’ll be there, let me know and at least say hi. I’ll try to do some booth duty at the Yahoo! booth and you’ll find me lurking in all the interesting panels. It’s rare that I hear overly dilbert-esque things at work, but just a few minutes ago, I walked by two people who were staring at a desktop PC’s tower which was laying sidewise on a desk and seemed to have some sort of mud on it (really). Funny enough, I was on my way down to the post office on campus to mail my taxes – I dutifully filled out four forms to mail off my check to the IRS & California. Hopefully that’ll be my last big company moment today. So today I went into my WordPress control panel and discovered 11 comments (and 53 spam comments) sitting in my queue waiting for approval. BTW, I only got three votes for yesterday’s rant (including one from my dad) – all said they want more “angry scott”.Â Â What do you think?